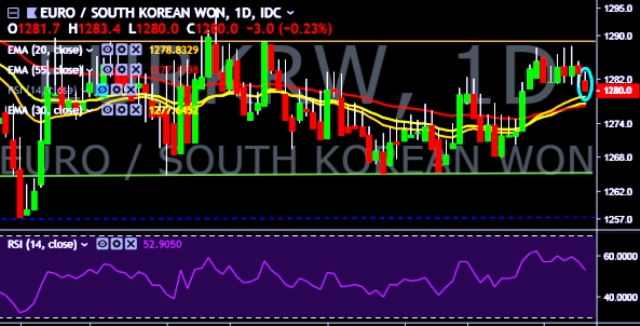 EUR/KRW is currently trading around 1,280 mark. It made intraday high at 1,283 and low at 1,279 levels. Intraday bias remains bearish till the time pair holds key resistance at 1,289 mark. A sustained close above 1,283 will take the parity higher towards key resistances around 1,289, 1,294, 1,307, 1,315 and 1,327 marks respectively. On the other side, a daily close below 1,283 will drag the parity down towards key supports around 1,278, 1,272, 1,265, 1,257, 1,246 and 1,234 marks respectively. Important to note here that 20D, 30D and 55D EMA heads up and confirms the bullish trend in a daily chart. Current downside movement is short term trend correction only. Seoul shares open up 0.38 pct. We prefer to take short position on EUR/KRW around 1,282, stop loss 1,289 and target of 1,272/1,265.